Parking was easy and there were plenty of shops and restaurants nearby. It only took 7 minutes to get to downtown. Convenient location. Could walk to everything. Bathroom was clean but could use some updating. AC/Heater was inside room and tended to be loud. Where to find Watkins Glen hotels near an airport? 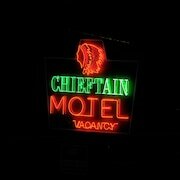 Where can I find hotels in Watkins Glen that are near tourist attractions? 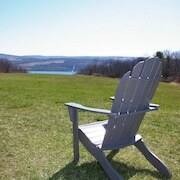 Arranging several days in Seneca Lake and would like to stay in central Watkins Glen? You'll find 6 Expedia-listed hotels and apartments within a 0.1-kilometre (0.06-mile) distance of the center of town. 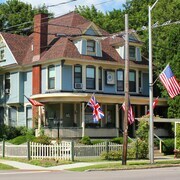 The Long House Manor B And B is the closest hotel to the center of Watkins Glen and is merely a quick drive away. 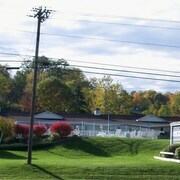 The Longhouse Lodge Motel is one of a few budget options in Watkins Glen. The Holiday Inn Express Elmira - Horseheads is situated 25 kilometres (16 miles) from the central part of Watkins Glen. 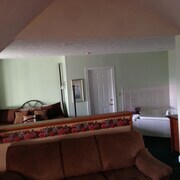 Or, alternatively, the Staybridge Suites Corning is 25 kilometres (16 miles) away. 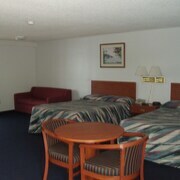 Other places to stay include the Fairfield Inn Marriott Corning and the Radisson Hotel Corning. After you have got to know Watkins Glen, why don't you tour a bit more of the area? The Finger Lakes Region vicinity has a number of things to see. Finger Lakes Region boasts lakes, and common Finger Lakes Region sights include craft workshops and open-air markets. Adventurous visitors might try cross-country skiing, hiking and picnicking in this part of United States of America. Looking for things to do? Consider spending some time visiting New York Chiropractic College and Cayuga Lake State Park, in Seneca Falls, 60 kilometres (38 miles) to the north of Watkins Glen. 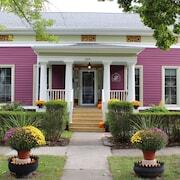 If you'd like to spend a few nights in Seneca Falls, check out the Hampton Inn Seneca Falls and The Gould Hotel. Or stay in Penn Yan, 35 kilometres (21 miles) to the north of Watkins Glen, where you can pick from the Finger Lakes Bed and Breakfast and Best Western Plus Vineyard Inn & Suites. Regardless of whether you're passing through or spending a few nights in Penn Yan, set aside a little time to visit the Torrey Ridge Winery and Prejean Winery. If sport is a favourite pastime, head to Carrier Dome, which is 100 kilometres (61 miles) to the northeast of Watkins Glen. Stay nearby to the action at the Sheraton Syracuse University Hotel & Conference Center or the Residence Inn Syracuse Downtown At Armory Square. Elmira - Corning Regional Airport can be found 25 kilometres (15 miles) from Watkins Glen. If you wish to stay nearby, you can easily secure a room at the Hilton Garden Inn Elmira/Corning or the Country Inn & Suites By Carlson Big Flats (Elmira). What are the most popular Watkins Glen hotels? Cozy Boat on the Watkins Glen Waterfront! Are there hotels in other cities near Watkins Glen? 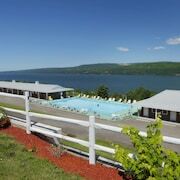 What other types of accommodations are available in Watkins Glen? Explore Watkins Glen with Expedia.ca’s Travel Guides to find the best flights, cars, holiday packages and more!